Head Coach Larry Bumstead, Scouting liaison/Team Manager Dave Chell and the entire coaching and support staff of the SMA Flames prep hockey team are very proud to announce that all five graduating players from this year’s team have secured post secondary commitments to further their education and play hockey at the same time this fall. Congratulations, Sarah, Kate, Kennedy, Julianna and Sydney!! Our Wind-Up Banquet this year will be held on Wednesday, April 24th at 6:30 p.m. Dinner will be held at The Press Box Restaurant at the Bell MTS Iceplex. Thanks for the amazing SMA memories, Sarah, Julianna, Kate, Kennedy and Sydney. All the best in the future and thanks for a great 2018-19 season everyone! Header photo taken during our final weekend together out in Penticton, BC for the CSSHL league finals. The Canadian Sport School Hockey League announced award winners for the Female Prep and Female Varsity divisions on March 5th, 2018. A big congratulations to Goalie Julianna Thomson (Top Goaltender) and Capatain Sarah Dennehy (All-Academic Team) on their accomplishments. Way to Hold High the Torch ladies! More information about the selection process and award winners can be found here. The Canadian Sports School Hockey League has published an article on Gr. 12 Forward, Kate Gregoire and her ability to juggle two sports and excel as she has at both. Bison women’s hockey recruits forward Sarah Dennehy for 2019-20 season. 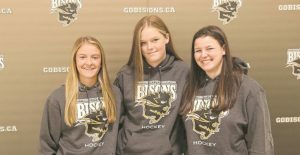 Go Bisons wrote an aritcle on Sarah and her accomplishments. Click Here to read the story. 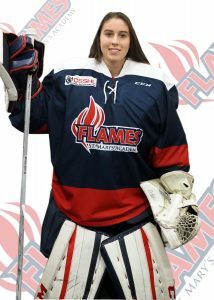 Grade 12 Goalie, Julianna Thomson has committed to the York University Lions where she will join them for the 2019-2020 season. Grade 12 student Kate Gregoire has committed to the 2018 National Champion University of Manitoba Lady Bisons for the 2019-2020 season. A Winnipeg Free Press article was written mentioning Kate and her accomplishments. Click Here to read the story.